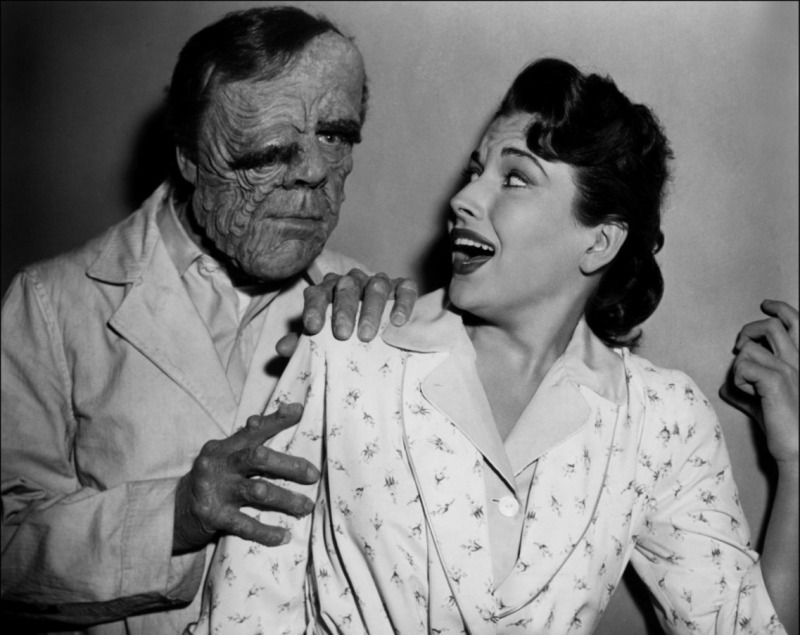 Like most of the giant critter films, this one begins with science gone awry, in the person of reclusive Professor Gerald Deemer (the wily old pro, Leo J. Carroll). He is concerned about the world’s food supply because he projects that by the year 2000, the Earth’s population will be — wait for it — 3.6 billion! Injections of a radioactive nutrient seem like a sensible alternative to traditional food: just look at how quickly Deemer’s test animals are growing. In the meantime, no one is trying the nutrient on humans, are they? My favorite aspect of this film is that it’s really two monster movies in one, as the story cuts back in forth between an increasingly outsized spider and the human beings who have been injected with the radioactive nutrient. Though the roles are not particularly challenging, all of the actors are fine. Clean-cut John Agar is solid as the local doctor who investigates the strange happenings in town, and 1950s pin-up model Mara Corday, as an aspiring scientist who works for Professor Deemer, isn’t just a pretty face. Director Jack Arnold made many sci-fi/horror flicks (Creature from the Black Lagoon, The Incredible Shrinking Man, It Came from Outer Space) and is fluid with the form, including knowing when to play things a bit camp. A funny thing about the 1950s B movies is that they were often shot like television shows, probably because they couldn’t afford a large number of cameras or complicated scene set-ups. As a result, watching them today on TV (or laptop) is almost as good as having seen them in the theater. The one exception to this rule is the special effects shots, of which there are many in the movie. The effects budget was probably around seven cents so it’s not surprising that some things (e.g., the rear screen projection shots when people are driving through the desert, the spider POV shots of descending tarantula fangs) look a little silly. 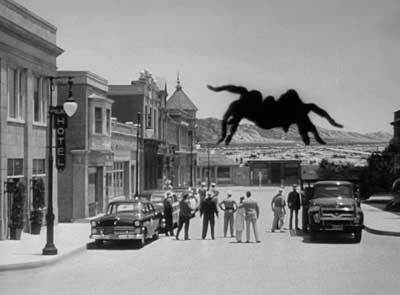 But for the period and budget, the effects team did a creditable job on the big tarantula by filming the real thing, blowing up the negative and then using mattes to put it all together. Not as slick as CGI, but it works. Will Tarantula affect your philosophy of life, moral evolution, artistic sensitivity and cultural sophistication? Not at all. But is it a fun, frightening Saturday matinee for the whole family? You bet. p.s. Warning to Eastwood fans: Every once in a while, this film is marketed as “Starring Clint Eastwood”. That’s a con job. He appears in a bit role as a fighter pilot for at most two minutes, and he is wearing a flight suit, helmet and breathing mask that render him almost unrecognizable. Some trivia concerning Eastwood and the beautiful Ms. Corday: They met in Universal Studio’s young talent program in 1954 and became lifelong pals. After Eastwood became a huge star and Corday’s career had dissipated, he began giving her small roles in his own films, most notably as the waitress who gives Dirty Harry “A lot of sugar” as a tip off when a coffee shop is being robbed. And now, thanks to you, I have a _Rocky Horror_ earworm.